When it comes to website development, content is the key to success. It contains all the necessary information of your business. 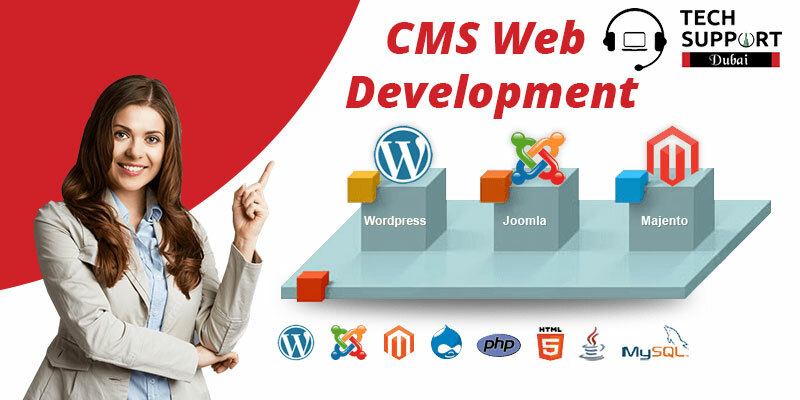 CMS web development allows you to manage the content in the way you want. It also helps you to design your content in a specific way which helps to improves the search engine ranking. Opt for content management system and streamline your website with fresh and latest updates. If you are searching for CMS web development in Dubai, connect with us at Tech Support Dubai. Our experts understand the requirements of your website and then develop it accordingly. We focus on designing your content in a way so that you can easily control your website. Our professionals are always eager to cater to your needs. The website’s menu is automatically updated while adding or deleting a page. Changes made to the content of a website are automatically posted to Google. Best practice with regard to search engines can be easily done. Why choose our CMS Web Development Company in Dubai? Tech Support Dubai are the best to choose from when it comes to CMS website development. Our experts provide the most affordable services to suit the requirement of your business. We understand it is not always possible to edit your website on a daily basis. But with content management system you can easily update your website with a few clicks. It is the latest browser operated application with which you can easily update your product list, mark changes in the price list, post latest news and events and change content. Do not delay while contacting us as we try to guide you in the best way. Before choosing us, have a look at the trusted services that we offer. Your search for affordable CMS Web Development services ends with us. Tech Support Dubai consists of professional web developers who are expert in the content management system. Our professionals will guide you with exact techniques to design CMS website. Place a call on our helpline number: 042053349 and get connected with our experts immediately. We offer CMS with meta tags and custom URL options as well. Hence, Speak to our experts and fulfill your business requirements. In case you are too busy to talk, drop us a mail enlisting your worries. Our professionals will get back to you in the next 24 hours. We also provide WordPress web development service in Dubai.